Martyn Collins Digital and Social Media Marketing Services: Attack of the TripAdvisors or Escape of the Lunatics? Attack of the TripAdvisors or Escape of the Lunatics? 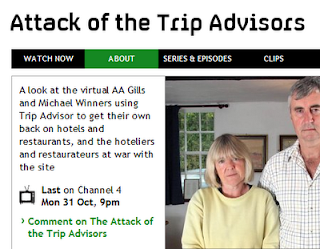 Last night's 'documentary' on Channel 4 was an attempt to tell the story of how important the TripAdvisor website has become to the tourism sector. The trailers lead us to believe that the documentary would be an exposé of the negative effect that bad reviews are having on some businesses, but it was impossible to watch it as anything other than a freak show. The Channel4 website tells us "The British hospitality industry is under attack. Businesses are being assaulted by ever-more nit-picking and abusive reviews. It's bad for their livelihoods and their sanity. But it's not the professional critics who are reviewing their hosts; a nation of virtual AA Gills and Michael Winners are using the Trip Advisor website to get their own back on hotels and restaurants. This Cutting Edge film reveals Britain's most meticulous Trip Advisors and meets some of the hoteliers and restaurateurs at war with the site." I believe that this documentary was brought to us by the same people who gave us Strictly Lady Sumo, Extraordinary Breastfeeding and Living with Brucie so we were assured of its high standards and quality from the start. The Guardian's John Grace tells us "First up were the proprietors. Step forward Mark, who couldn't see why packing his hotel with the heads of stuffed animals and semi-pornographic art might not be to everyone's taste. And then we had Colin, mine host of The Olde Forge in Norfolk, who appeared to have modelled himself on Basil Fawlty. A man who appeared not to have a good word about any of his guests. But Mark and Colin were paragons of mental health, compared with the Trip Advisors themselves who appeared to have dedicated their lives to writing lengthy reviews that only the owners of the establishment were likely to read seriously. They all appeared to invest a great deal of time and money, searching out places to eat and stay where they were almost guaranteed to have a bad time. How bonkers is that? We've all had the odd crap meal, but imagine the mentality of someone who sets out with that as their goal. So meet Sean and John, (see previous note re lunatics!) whose first thought on entering any B&B is to ask themselves why it's not as good as the Ritz, and waste hours going through their 15-page check list, assessing the cleanliness of the toilet brush and checking if there's any water in the kettle. It's a big no-no if there is, apparently. You live and learn. Ricky was in a league of his own, though. He drew dots on the sheets in ballpoint pen to check if the sheets had been changed. His delight when they weren't was all too obvious. "They should have known to check with me that I had flakey skin and would need the sheets changed daily," he said. Ricky's gran said he'd been bullied at school. Why am I not surprised? If you missed the programme it is still available to view on the Channel4 website. I'd be really interested in any views people have of the reviewers, TripAdvisor itself and the existing QIT and AA schemes - use the comments section below.